The N2, Lubombo Mountain, Mofolozi River and Indian Ocean, border this unique, natural resources rich district. Economically this district is the second least contributor to the provincial GGP after Sisonke District, standing at 1%. Stastically there are 573 341 people living in this district of which 38 193are employed with a total labour force of 299 602. Umkhanyakude district is also known as the Elephant Coast for its rich and wild natural tourism resources. The district's most natural resource attractions include game reserves and parks, beaches, cultural & adventure tourism and also birding watching destinations (avi - tourism). The district has identified main tourism activity hubs to include Hluhluwe, St. Lucia, Mtubatuba, Sodwana / Kosi bay and lake Sibaya and Mkuze. As this district is more rural than any district in KZN, its sectors are mainly in agriculture, tourism and government services. 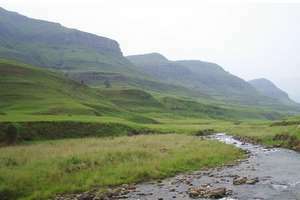 UMkhanyakude is situated in the northeastern part of KwaZulu-Natal, extending from the UMfolozi River up to Mozambique and Swaziland borders. 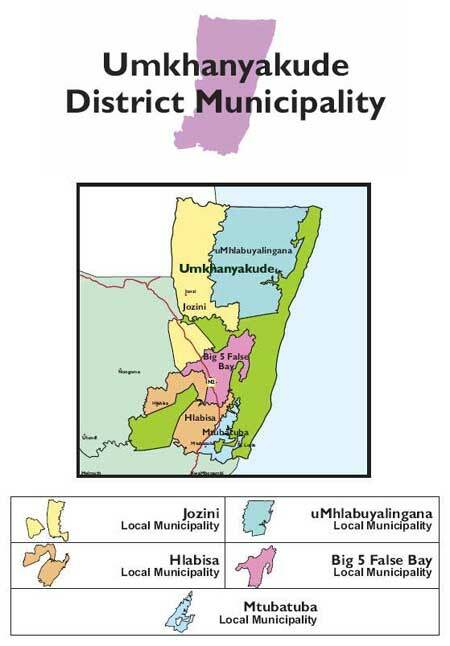 The districts has five local municipalities namely uMhlabuyalingana, Jozini, the Big Five False Bay, Hlabisa and Mtubatuba. The district is mainly rural, Mtubatuba in the south being the only formalized town. However, several towns are growing rapidly, such as Hluhluwe, Manguzi, Jozini, Mkuze and Mbazwana. Below are packaged projects throughout UMkhanyakude District with concise project descriptions, information on locations, current statuses, ownership, return on investment and importantly project requirements. SC5 - Lebombo SDI Corridor, focusing primarily on Developments along the southern and eastern sections of the Pongola Poort Dam, tourism facilities along the new SDI Route to Mozambique, large scale agricultural development and enhancing the development opportunities related to the Greater St Lucia Wetland Park. Support for existing and potential land reform cluster projects across Umkhanyakude with respect to livestock, maize, biofuels, nuts etc. The KwaZulu-Natal Province has both growing and maturing population, presenting opportunities and challenges to the province. According to Statistics South Africa mid-year estimates (2007), the KwaZulu Natal population was estimated at an average size of 10,0 million people. 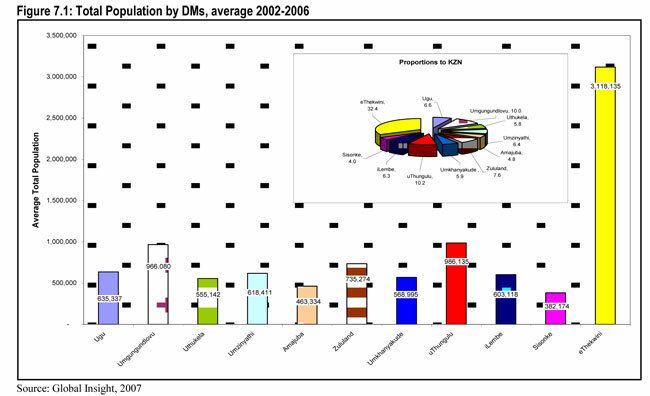 The largest number of these people lived in eThekwini Metro (32.4% of the provincial population), followed by uThungulu district (10.2%) and uMgungundlovu (10.0%). 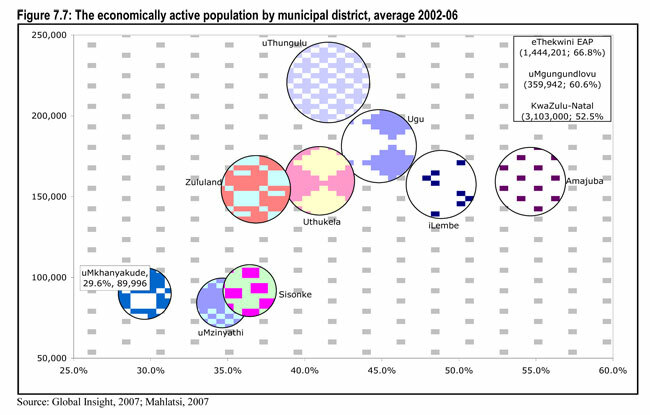 UMkhanyakude was the fourth least populated district in the province with approximately 5.9 percent (Figure 7.1). 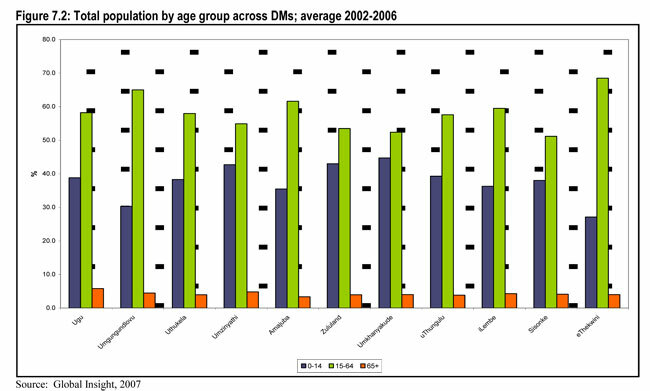 Figure 7.2 shows the distribution of the population across DMs by age group. The largest proportion of the population in Umkhanyakude was the age group 15-64 years (52.4%) followed by age group 0-14 years (44.6%). The elderly population contributed the smallest portion of the total population (4.1%). A population distribution skewed towards the working-age population has a tendency of translating to high unemployment levels, particularly if individuals are not appropriately skilled for available job opportunities. As a result, the higher number of both young individuals and people in the labour force overall will require more spending in education (primary and secondary) and skills development. 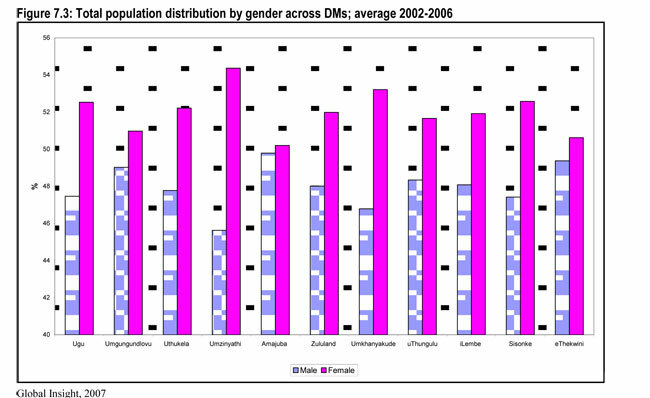 The majority of the population in uMkhanyakude and across all DMs was female during this period (Figure 7.3). Geographically, uMkhanyakude was the most sparsely populated district in the province, with 0.04 people per km2, against the provincial average of 113. Of 568,9 thousand population, only 4,2 percent people are regarded as urban residents. While this suggests that there is no pressure on environment and that there could be more available land for development and agricultural use in this district, it also indicates a potential challenge with regard to infrastructure palling due to dispersed settlement settings. 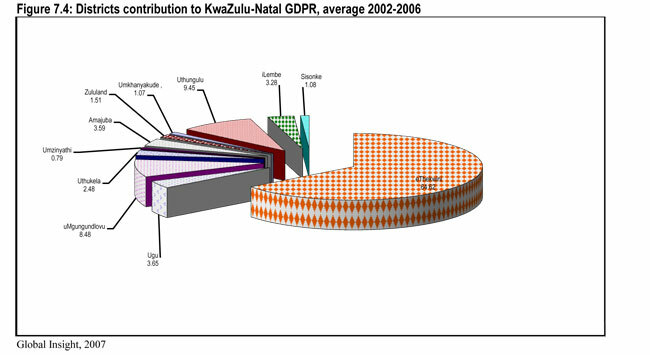 Between 2002 and 2006, the GDPR for KwaZulu-Natal was estimated at an annual average of R177, 8bn. There was a significant growth of 18.8 percent from R163,9bn in 2002 to R194,7bn in 2006. 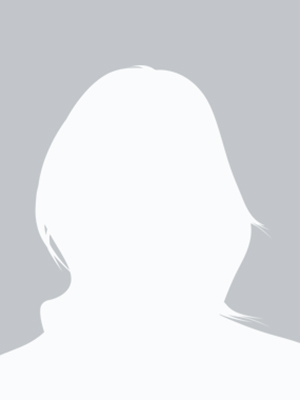 UMkhanyakude contributed 1.1 percent to the provincial GDPR, making it the second-to-least contributor after uMzinyathi. 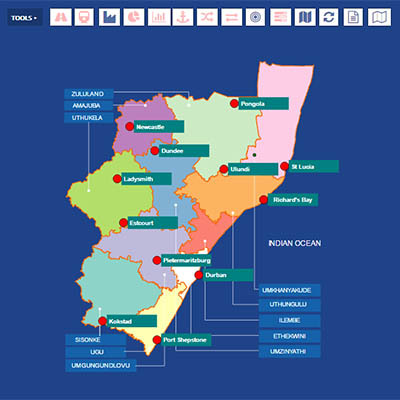 EThekwini (64.6%), uThungulu (9.5%), and uMgungundlovu (8.5%) made the most contributions (Figure 7.4). 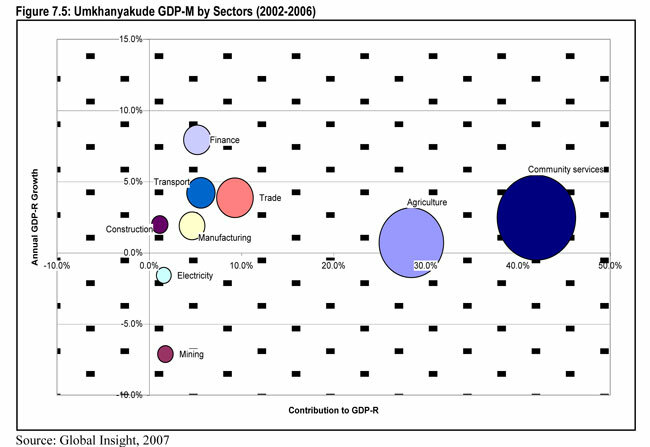 Figure 7.5 shows uMkhanyakude’s GDP-M by economic sector between 2002 and 2006. During this period the economy of the district grew by an annual average of 2.1 percent. The economy is driven mainly by Community Services, Agriculture, and Trade, together contributing nearly 72.0 percent of the district’s GDP-M.
Finance and Transport were on average the fastest growing sectors in the district at 7.9 percent and 4.2 percent respectively; Finance saw a sharp rise in average growth between 2005 and 2006 from 2.8 percent to 18.0 percent. Agriculture, on the other hand, slumped from 4.6 percent in 2005 to -7.0 percent in 2006, and was accompanied in its contraction by Mining which experienced consistent negative growth throughout the 5 year period at an annual average of -0.8 percent. 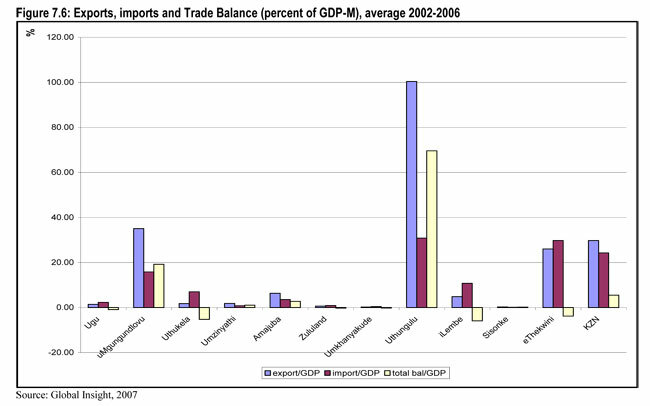 Figure 7.6 shows the percentage of export, import and trade balance (as a proportion of GDP-M) across all DMs. It transpires from this figure that the impact of international trade on the economy of uMkhanyakude is almost negligible. From 2002 to 2006 the district’s imports and exports were on average 0.4 percent and 0.2 percent of the economy’s GDP-M. Consequently, the district had a negative trade balance of 0.2 percent of its GDP-M.
As a proportion of the district labour force3, uMkhanyakude’s EAP was about 27.0 percent. The district was the least economically active in the province during this period. During the review period, there were about 61,000 unemployed people in the district. This was the third lowest level of unemployment after Sisonke (49, 000) and uMzinyathi (59,000). During the same period, the district’s unemployment rate4 was among the highest in the province (64.6%). It was lower only than that of uMzinyathi, and a massive 19.1 percentage points above the provincial average. As with the other districts, uMkhanyakude’s unemployment rate was more pronounced among the Black population group (65.4%). The respective rates for Indians, Coloureds and Whites were 23.3, 13.1 and 6.3 percent. This was in line with the average provincial unemployment structure. 3 EAP/LF = Labour participation rate or ratio. 4 Expanded definition; includes those unemployed but not actively seeking a job. During the period under review, KwaZulu-Natal employment totaled an annual average of 2,1 million workers. 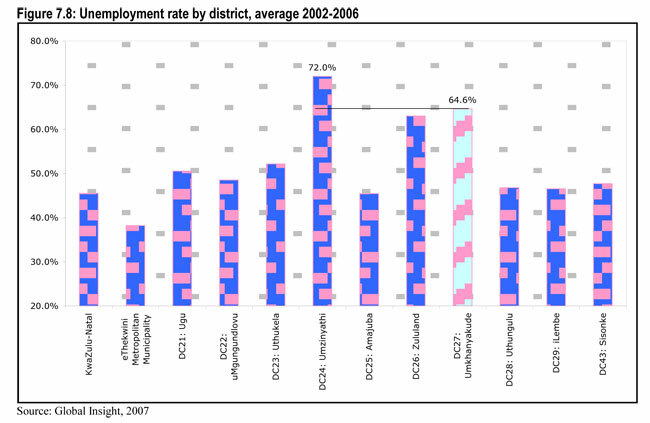 UMkhanyakude’s employment was the second lowest in the province; higher only that that of uMzinyathi (Figure 7.9). The district’s formal employment was among the relatively lower levels at 69.8 (Figure 7.10). The formal employment sector in the district was dominated by the Community Services sector at 39.0 percent (Figure 7.11). Education and Health sectors were equally important contributors to the sector’s employment, together accounting for 62.5 percent (Figure 7.11). This shows that the provincial education-and-health inclined provincial expenditure budget reaches this district proportionately, as with uThungulu and iLembe. Agriculture was the second major employment sector in the district, contributing a solid 30.0 percent to the district’s total employment. 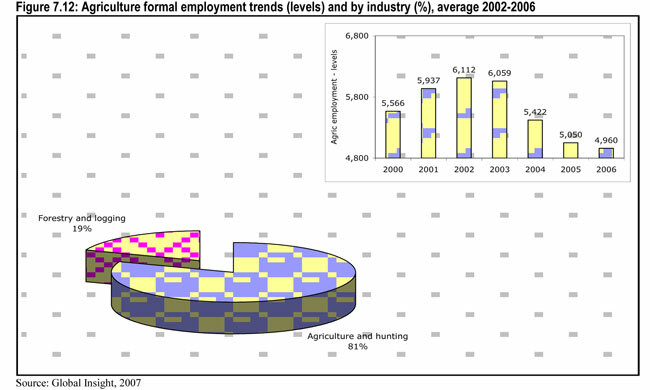 A larger part of this sector’s employment was recorded in Agriculture and Hunting industry (or sub-sector) than in Forestry and Logging. Nonetheless, the overall contribution of this important sector to employment in uMkhanyakude has been shrinking since 2003 (Figure 7.12). This needs urgent investigation and, if possible, revival. KwaZulu-Natal’s informal sector employment, recorded mainly in Trade, Construction, Community Services, Manufacturing, Transport and Finance5 sectors, was generally skewed towards the Trade sector. This was true in all but four districts, each having more than half the employment in this sector involved in trade of some kind; uMkhanyakude was no exception. Unlike manyother districts, the district also had a peculiarly high informal employment in Community Services (Figure 7.13). 5 These are the sectors recorded by Global Insight; they are easier to monitor and collect data thereon than the remaining others. 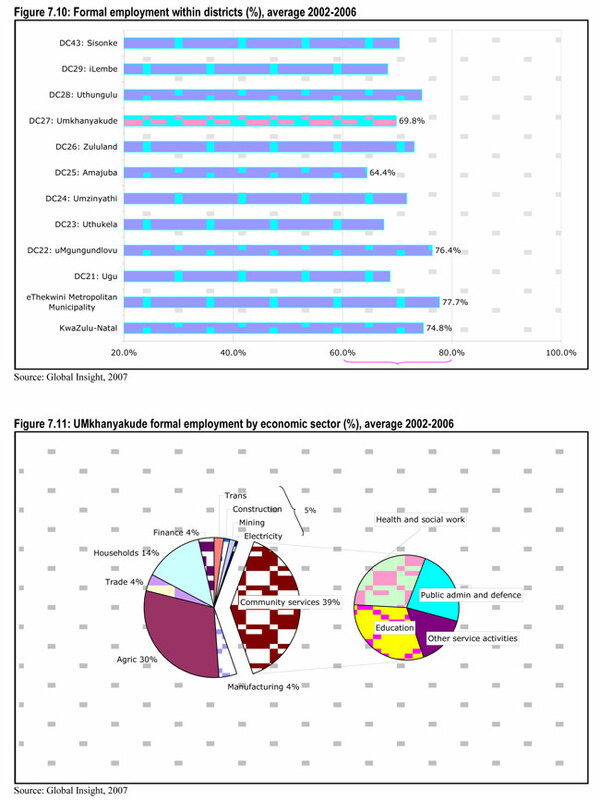 Figure 7.14 shows the distribution of formal employment in the Trade sector. Unlike in uThungulu, uMgungundlovu and iLembe, uMkhanyakude’s formal employment in trade was concentrated in three of the four main industries, with ‘Retail Trade and Repairs of Goods’ contributing only 1.0 percent. The informal employment sector could probably have followed a similar structure. 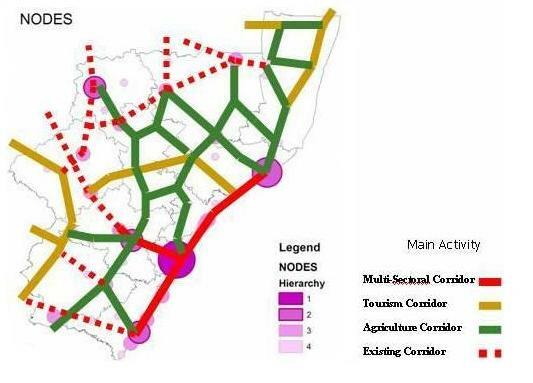 The dominance by Hotels and restaurant could result from the district’s strategic geographical position; the famous Elephant Coast, home to South Africa’s largest herd of indigenous African elephants is in this district. 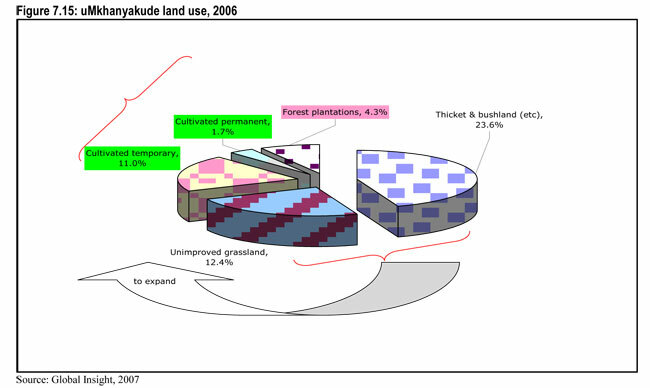 In 2006, uMkhanyakude’s share of the KwaZulu-Natal soil was a gigantic 13.7 percent. This was the second largest district after Zululand (15.9%). However, only 1.7 percent of this was used for permanent cultivation, and an additional 11.0 percent was cultivated temporarily (Figure 7.15). As can be recalled, a solid 30.0 percent of workers in the district were engaged in Agriculture – particularly Agriculture and Hunting, and the same sector’s employment has been collapsing since 2003, moreover it transpires hereunder that the falling employment sector is actually very tiny. This is a warning bell, and ‘business unusual’ should be taken ashore this district. Between 2002 and 2006, there was a consistent decline in reported incidences of crime in the province (2.4 percent annual average). 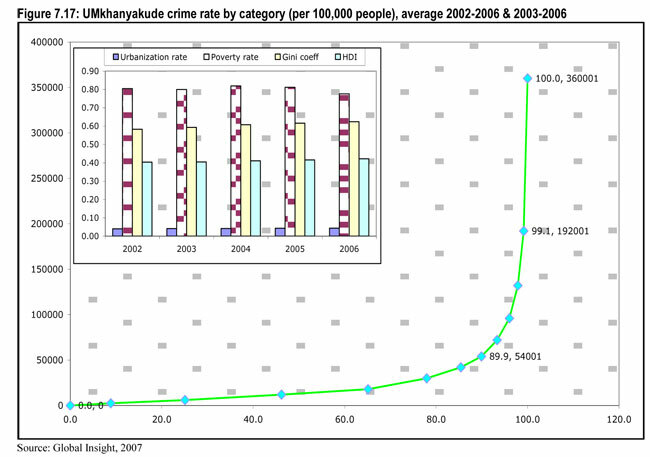 UMkhanyakude, and uThungulu to a less extent, was the only district resistant to declining crime rates. However, 2003 forward saw a comprehensive decline, though with differing magnitudes; the provincial collapse rate in crime was 5.1 percent, while Amajuba, Sisonke, uThukela and Zululand enjoyed the highest decline of at least 8.0 percent each. UMkhanyakude’s crime fall was the second lowest after eThekwini’s. This was a great achievement, though, after the experience of a positive average growth for 2002-2006. During the period 2002 to 2006, the most common crimes in this district were theft, assault and burglary. 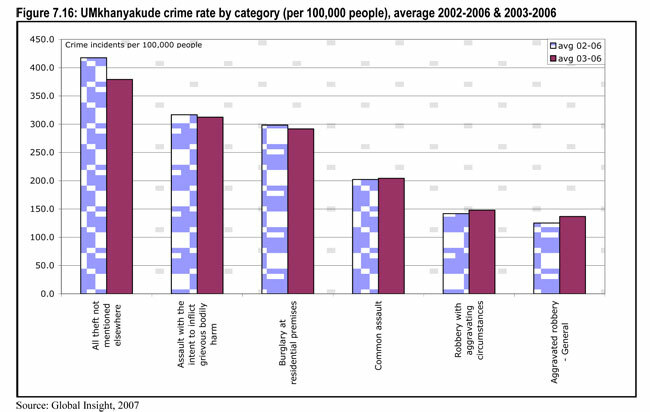 However, these crimes were not too pronounced as the highest rate was 400 incidences per 100,000 people (Figure 7.16). Common assault and robbery with aggravating circumstances were on an increase between 2003 and 2006. These were also very rare (less than 150 per 100,000 people) and can thus be easily conquered. UMkhanyakude is one district with dire development challenges. Figure 7.17 reveals that on average, income distribution among households has also been wide. On average, a cumulative 87.5 percent of households in the district earned at most R54,001 per annum at least 99.1 percent earned not more than R192,000. This means that at lest R168,000 was accrued to only less than one percent of the district’s households. Figure 7.17 also shows the urbanisation rate, poverty rate, Gini coefficient and Human Development Index (HDI) for this district. It is clear from this graph that the proportion of people living in poverty in this district outnumbers any other in all the other districts, and this has been quite stagnant. However, a slight decrease was recorded between 2005 and 2006. The district is dominantly rural, with urbanisation rate of only 0.4 percent. Unlike in other districts, the Gini coefficient in uMkhanyakude has also generally stayed the same, all these (and other) indicators leading to a stagnant HDI.